Powder Monkeys were the explosives experts/handlers on the ship - hence the mass amounts of dynamite slung over one shoulder, large bag of gun powder at the hip, and (my personal favorite) the bag full of bowling ball bombs :) T'was a greatly fun challenge me hardees - land ho! that's really fantastic Zach. 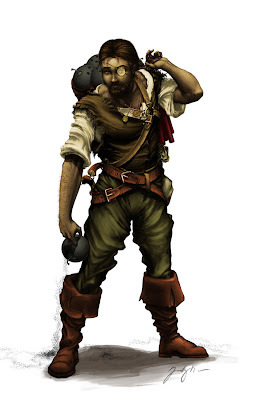 the color choices are excellent for a dingy powder-keg guy, all dirty all the time. Love the detail in things like the leather straps and buckles. The wrinkles feel a little forced to me, but maybe that's a style choice too. It's wicked good. nice job.